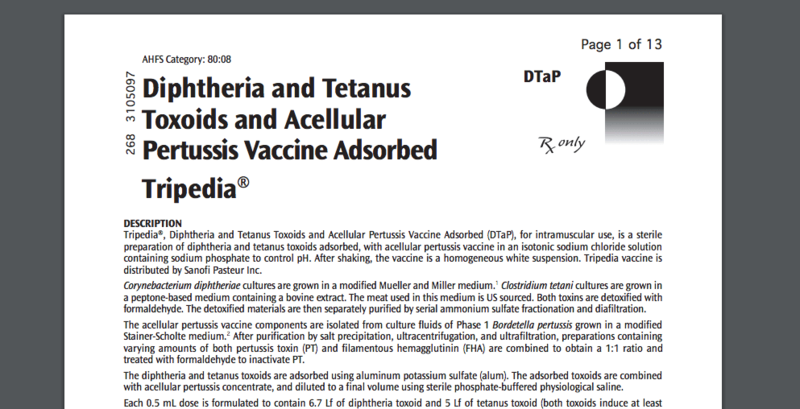 Following a long-winded, and now seemingly unnecessary campaign over the last few years to convince the public that there is no connection between vaccines and autism, the FDA released a document in which they admit that autism is a possible side-effect of the Tripedia vaccine. In typical government fashion they have released this wildly important and previously contested tidbit of information on page 11 of a 13 page insert sheet for the Tripedia vaccine, after tyrannically pressuring Americans to believe otherwise. This is akin to the recent weather modification “notice of intent” buried deep in a Pasadena newspaper, that quietly admitted the American government is modifying the weather with silver iodine, and whatever else they chose to experiment with; but one can be sure the people will find out about any new experimentation by keeping their eyes on the back half of local newspapers; because that is where all important information can be found that Americans need to stay informed, right? There have been many others who have spoken out about this connection in recent years, so for them, this is not a new concept. And for those who have felt the direct effects of this extreme negligence by those whose primary purpose is to inform and protect the American public, this is a validation. This is a vindication, but with a bitter aftertaste, as it reveals just how malicious and deceitful a government must be to not only distribute a product for use by the nations children that knowingly causes autism (among others terrible side-effects), but to lie and pressure the public to use it anyway. Then, to make them feel as if they were crazy or irresponsible parents for not trusting them, is simply…evil. That word should not be thrown around lightly, but with all the past whistleblowers and public figures that have spoken out in regards to vaccines, there can be only one of two possibilities: Either the government is so inept and incompetent (which at this point is a definite possibility) that they were simply unaware, or they knowingly forced these dangerous chemicals on the country’s children and adults alike. Both are equally distressing, yet the latter seems all too possible when many of the other recent revelations are taken into consideration; from GMOs and glyphosate, to Flint and many other cities across the nation that are suffering, not due to a random mistake or miscalculation, but due to simple dereliction of duty by government officials. One can make the claim that there is no inherent villainy taking place here, but rather that they simply did not know until now. With all the credible and validated information that has already come out, that is not a possibility. Only taking one claim into account, which was the recent admission by a CDC scientist that information verifying this same connection between vaccines and autism was intentionally trashed, it now becomes clear that they either ignored this valid concern by a respected scientist, or they already knew and intentionally buried it. Taking into consideration all the new information, what seems more likely? Many of the American people continue to shield their delicate constitutions from the reality that is steadily encroaching in its heavily armored military vehicle. That reality is that the interest of the American people and the interests of the ruling class, are no longer the same. One could make the argument that they never were. Even those who refuse to see the truth, have an innate intuition that something is wrong; something is changing; something must be done. Yet sadly, many of those who have newly arisen due to that intuition are wrongly placing their faith (most for the first time in decades, which is by design) in the same system that recreates the same problems, just with a new puppet, every four years. This cycle must be stopped, and the first step is to hit critical mass with public awareness; and as many are beginning to see, that awareness is at an all-time high. Spread the truth, and follow the change, be the change.